The mammoth crowd that turned up for the Requiem Mass of fallen Ugandan music icon Moses Ssekibogo, aka Mowzey Radio, were treated to more than the usual routine when presiding priest, the youthful Fr Deo Kateregga Kiibi, took to the pulpit. Fr Kiibi used the pulpit to take a swipe at the different groups of people that were represtented at the Mass. 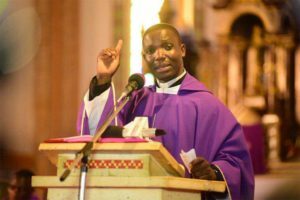 Preaching humility, Fr Kiibi, the director of information at Kampala Archdiocese, sent the congregation into bouts of laughter when he took swipes at the evidently uncomfortable celebrities. Without making any reference to the deceased Radio, Fr Kiibi advised those in church to abandon habits like using drugs, living extravagantly and abandoning family. “Many of you paint the picture in public that you are well off, it is not until you die and people come to your home that the truth is revealed on how poor you were. Many are living off loans,” he said without mincing words. Immediately after his sermon, social media was buzzing with messages of how the young former journalist had taken the day with his sermon. Among the people in attendance was Buganda prime minister Charles Peter Mayiga, who told the congregation that he was saddened by Radio’s death. “His music brought all of us lots of joy; and a number of his songs filled us with hope. Let us all give our best to whatever we do. At 33 years Radio accumulated tremendous goodwill through sheer sweat and passion. Radio has been a great talent. I loved and enjoyed most of his songs,” Mr Mayiga said. He said he would often listen to the songs whenever he looked for inspiration. Katikiro Mayiga also cautioned musicians to hire professional managers who can monitor their moves and actions. “Having fun is not bad. As a young person, it is highly recommended. However, you have to employ professional managers who can advise you on where to go and where it is not appropriate to go for your own safety,” the Katikiro said. He also encouraged young people to emulate Radio so that the country can shower them with love. The Katikiro commended the church and Fr Kiibi, who had just given a speech calling upon the public not to judge Radio regardless of his lifestyle. Speaking at the same function, one of the main celebrants at church in his tribute to Radio said though Radio wasn’t an ardent Church-goer, he has been a religious person. Meanwhile at Kololo Independence grounds, where the public are to gather for viewing of the musician’s body, crowds have been gathering since the early afternoon. Police and the military have deployed heavily to ensure security of all that will attend. When PML Daily visited the grounds this afternoon, some quick construction works were ongoing to put right areas that had previously been damaged. According to promoter Balaam Barugahare, Radio indicated in his will that when he dies, he doesn’t want people to grieve but rather a concert should be organised to celebrate his life.